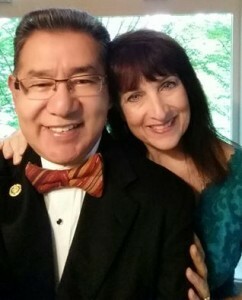 Auggie and Maureen Gonzales enjoying the evening. Check out Auggie’s Guatamalan tie! What a great evening! 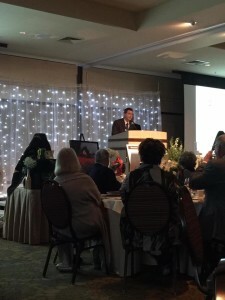 Thanks Grant Gerke and all the committee, especially Linda Potter and Lisa Joyce who do so much work on the event. 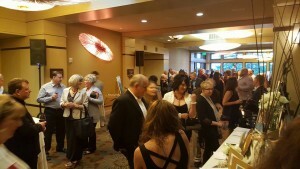 It was a fun night and unofficially we raised close to $150,000. We also saw the Paddle Raise provide $43,000 for Helping Hands. Jack Maxwell III did an amazing job sharing his story and sharing how this organization has made a huge difference in his life. 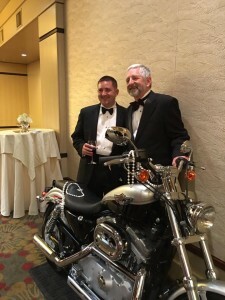 The Harley Davidson went as the Golden Ticket to Early Bird President Elect Ron Wolfe. And the Duck will stay the OSU colors for another year. It’s been a busy week. We started with club on Wednesday, the 20th with last minute Auction reminders. Also you can sign up for Neighbor to Neighbor Day on May 7th to help clean up an elderly person’s yard through Faith in Action. Click here to sign up.. Also we might be doing a Habitat build if enough people signup. Tunes on Tuesday is coming up this summer. We’re sponsoring a band along with the Early Birds and we’ll be either sharing a tent or doing one of our own. Anyone want to work on this? See Leah. The Big News is that this was our next to last meeting in the Cap and Gown Room. Fox is doing a lot of changes and with their new dining hall, Heacock Commons/Cap and Gown Room will turn into the engineering department. Next week, April 27th will be our last day in our meeting space we’ve enjoyed since the 1980’s. And I think it knows it too, during our meeting two Rotarians had their chairs break and I noticed that three tables were leaning to the side a bit. Apparently the furniture is getting tired. Staring May 4th, we’ll be at Friendsview, but in both May and June we’ll be around, so be sure and check the calendar or watch for your e-mail to remind you where to come for club. We’ve also got our annual Memorial Day clean up on Thursday, May 26th at 3 pm. Again, click here to sign up. middle east expert. He has advised presidents and secretary’s of state for the last 10 presidents. He shared that the issues of the Middle East are very complex and not able to be understood in 30 second sound bites, which is what we usually hear. We also hear from a media perspective where you have a reporter sent to the area and they try to explain it with very little knowledge and background. He also reminded us that the Quron contains sections from the Torah and the Bible, it simply continues the story. Dr. Peter Bechtold Dr. Bechtold was so fascinating that members stayed and stayed and the program finally ended at 2 pm. Dr. Bechtold was pretty from amazing and about half the club stayed until 2:00 pm to learn and listen more. 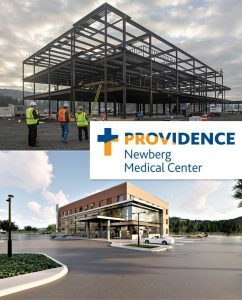 For more information on Dr. Bechtold, click here. This week we had a social meeting with lots of time for Rotarians to visit and talk and share a few stories. 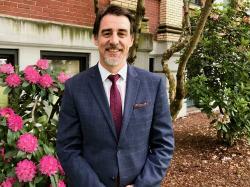 Corey Zielsdorf shared the reflection about an old friend who caught up with him recently and thanked him for being a good friend in a time of need. Corey didn’t even remember the specifics of the situation, and it just goes to show that you never know how a small kindness could make all the difference to someone. 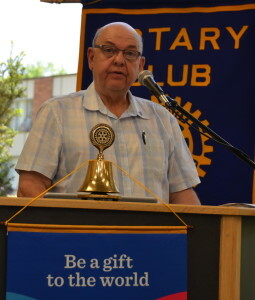 Prez Jim took a moment to talk about the 4 Way Testimonial and how talking about how it has made a difference in our lives makes it a bit more real than just reciting it aloud. AUCTION!!!! Yes, it is next week. 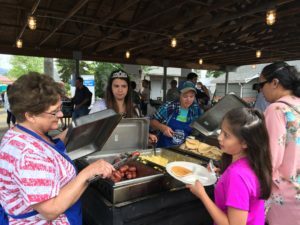 We don’t have quite as many donations and ticket sales as last year, but it’s still pretty good. Geoff Gilmore reminded us that you never know what will happen when you invite someone to attend. He invited some new friends and encouraged them to go online to make their dinner reservations. 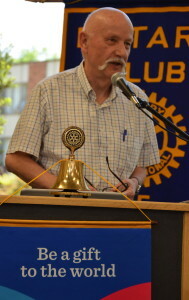 They did and read about Rotary and what the Auction proceeds do for the community and beyond. They were so impressed they donated a 100th anniversary Harley Davidson motorcycle and a sauna! Yes, two big and cool donations! Thanks Geoff and thanks Rob Dailey for the great auction website that really facilitated this wonderful and generous gift. 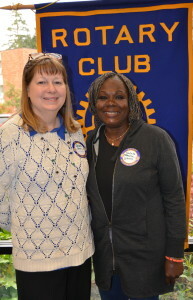 Jeff Lane brought guests to lunch, his wife Jackie and she introduced us to her guest a fellow Soroptimist from Nigeria, Funlola Ade Muyemia, who is visiting Oregon before heading to a Soroptimist convention. She toured Adec and is looking at the dental equipment for projects in her country. Her club sponsors a school and a variety of women’s health initiatives. And Funlola’s husband is a Rotarian! 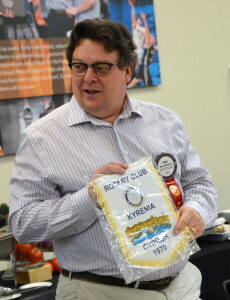 Dale Welcome brought the banner from the Kyrenia, Cyprus Rotary Club he visited while on a business trip. 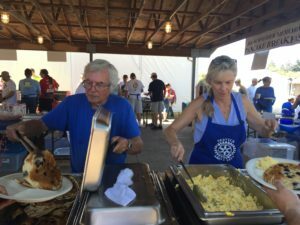 Everyone was reminded that you can stop in and attend a Rotary meeting anywhere in the world (you can find a meeting on the ROW app for your phone). And you’ll likely be treated well. 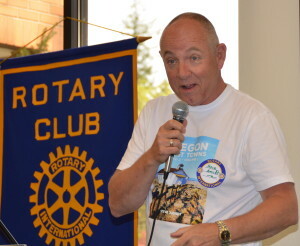 Dale had two nights of entertainment and fellowship with the Cypriot Rotarians. It was a great meeting and we’ll be doing more of these social meetings in the future. Here is Auction Update, which is less than two weeks from now. So you can see we still have a bit to go. DEADLINE for item donations is this Friday, April 15th (double deadlines!) So, get your stuff in now!. We also have to give the Allison Inn & Spa the final head count on Friday as well, so sell those remaining 66 tickets by Friday too. You’ve got a bit longer to pick up those 25 Golden Tickets, see Scott Karn to buy those. 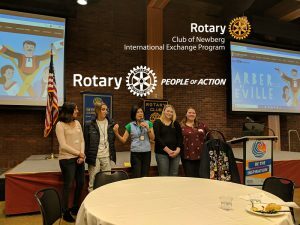 Leadership Newberg is looking for a service project. If you’ve got an idea for one, talk to Aaron Lewis. The Turnaround Books project is looking for volunteers to deliver kids books to waiting rooms around Newberg. Talk to Leah Griffith about that service option. 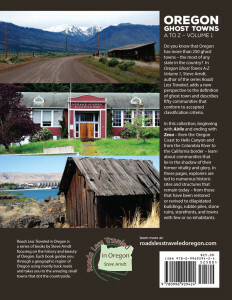 Our speaker this week was Steve Arndt, author of Ghost Towns of Oregon A to Z, Vols 1, 2 and 3. 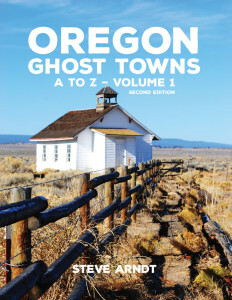 There are 256 ghost towns in Oregon, though they are at different levels of their “ghostliness” from those with empty building and no people to those with buildings and a few people to those with no buildings, no people and simply a name in the past. Steve and his wife have visited them all and the pictures are in their three books. His books also tell you what kind of vehicle you need to get to the town. Some are right off the highway, others down a gravel road and a few require 4 wheel drive and the willingness to bounce along a rutted road for a few miles. Horse Heaven was a town formed at a mercury mine, so if you go there, be careful, there is still mercury. Lone Pine Village was in The Dallas and it was a shaker village, the kind where the minister got the shakes as part of his ministry. Maxwell was a community of both white and African American loggers. They would work together during the day, but at night, everything was segregated.